The San Francisco area’s tidal bay, adjacent to the Pacific Ocean, is home to some of the country’s most challenging weather. The bayfront village of Sausalito, California endures nightly fog, high humidity and occasional wind-blown rain that can hit buildings sideways. Preventing moisture from accumulating inside buildings and underneath windows, roofs and even siding panels is a challenging task – builders must understand how to effectively manage moisture and which building products to use. In response to modern building science that demands water be let out, rather than kept out, Benjamin Obdyke introduced HydroGap Drainable Housewrap for these exact conditions. Considering that Sausalito is widely known for its weather-beaten houseboat communities, which require the most effective moisture management systems, the importance of high-quality building and renovating is multiplied ten-fold. 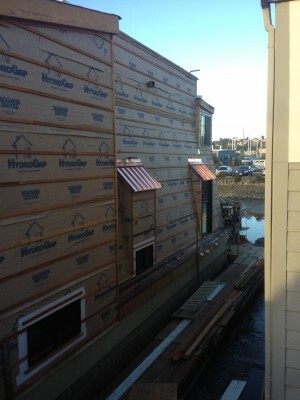 In September 2014, Insight Builders was tasked with preventing water intrusion in a 1970s style houseboat. The home had been renovated two times previously in unsuccessful attempts to mitigate unhealthy factors such as rot, mold, water damage and poor ventilation – problems for many houseboats in the region. But issues beyond the coastal weather made Insight’s job even more complicated. “Houseboat renovation is a completely different environment than the normal building world,” said Insight owner Charlie Warner, who has dealt exclusively in houseboat remodels for more than 15 years. 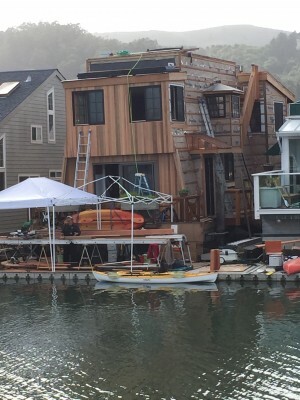 “During the course of a houseboat project, we have to navigate changing tides, work off floating docks and figure out how to be secure when using ladders and climbing up the sides of buildings. That’s not to mention structural problems that can be exacerbated in a houseboat. With the help of HydroGap and HydroFlash, the successful project and its builder were recognized as early adopters of modern building science. The homeowner, a former industrial designer with a keen eye for detail, was thrilled with the result. Local competitors who have taken notice of Insight’s work are now using more Benjamin Obdyke products on their own projects, according to Warner. Check out our resources page for the full case study. For more project photos you can find them in our jobsite gallery.